A spaceship-like router carrying the Republic of Gamers (ROG) branding landed on our HQ. Meet the ROG GT AC5300 Rapture, ASUS’ answer to completing your gaming setup. Here’s our take on the router that feels like it came from outer space. ASUS went all out in providing their consumers the whole package. Inside the box, the router came with eight antennas, three power plug options (Type I, Type F, Type G), a power brick, and a black LAN cable, which is more than enough to get you started. The Raptures design is a far cry from the rectangular or elliptical routers we commonly see on the market. It has intricate angles and cuts around its square body and a red black and orange color scheme. You’ll also notice that once all eight antennas are attached, it looks like a wing of a modern aircraft. On top, you’ll see ASUS’ signature ROG logo. And on the front, you’ll find the LED notification lights for Power, 2.4Ghz band, 5.0Ghz band, LAN, and WPS. The left side houses the WiFi, LED, and WPS buttons while the right side is completely devoid of any buttons or ports. At the back, we have eight Gigabit LAN ports, two USB 3.0 ports, and a WAN port to connect the router to the modem. You’ll also find the DC-in, power switch and reset pin-hole on this side. The bottom of the device has four rubber feet and has full ventilation. Dust is going to be a problem though because the internals is exposed. You’ll want to make space for the Rapture as it takes a lot of room with its size. It’s also rather bulky and quite heavy. The device, although encased in polycarbonate, is well built and feels sturdy enough. Setting up the router is easy, just follow the instructions on the quick start guide. You can set it up in two ways — Via Wired connection or Wireless connection. 1. Plug your router into a power outlet and power it on. But before doing that, assemble the router first. Connect the eight external antennas to the body. It’s relatively easy to do, just connect and tighten the screws. Be sure to twist the base part of the antennas, not the antenna itself. Then assemble the power supply, by choosing the appropriate plug type for your socket (Type I, Type F, or Type G). Connect the router to your power supply then plug it into a power source. Turn on the router by pressing the power switch at the back, then connect it to your internet Cable or Modem. For a Wired setup also connect your PC to the router via a LAN cable. This step is only for those setting up via a wireless connection. Connect to any of the three Service Set Identifiers (SSID) the router has. Take note, the default SSID’s of the router would be ASUS_XX_2G, ASUS_XX_5G, and ASUS_XX_5G_Gaming and are open connections. 3. The web GUI launches automatically when you open a web browser. If it does not auto-launch, enter http://router.asus.com. Then set up a password for your router. During your initial setup, you will be prompted to change the username and password of your router (This is different from the SSID). Then you can set the network settings automatically or manually. The ROG Rapture is jam-packed with features. It has three operating frequencies — one 2.4GHz and two 5.0GHz making it a tri-band router. Hence the reason why it has three different SSID’s. It also has eight adjustable external antennas that boost its signal coverage which also utilizes Mimo Technology. Most of its features though are aimed at gamers. The Dash Board is your all in one internet monitor. It shows your network traffic, wireless state, WAN state, mode, internet status, and your network ping. ASUS partnered with Trend Micro to provide real-time network monitoring to the GT-AC5300 Rapture. Game IPS is the routers software protection for viruses, malware, and other intrusions apart from that though it also includes parental controls in which a user can schedule internet usage for connected devices and setup web and app filters. This feature is the highlight of the router. ASUS’ Game Boost promises to prioritize your internet’s bandwidth to your games when it’s active. It also has a monitor which shows download and upload speeds of each connected device. The ROG Rapture features ASUS own Game Private Network powered by WTFast which is geared towards reducing your ping time and variation. To be able to use this feature, however, the user needs to register for an account and enter a subscription. Thankfully ASUS included a free membership if you sign in through the router. The game profile is the router’s automatic port forwarding feature powered by Portforwarding.org. It removes the hassle of manually configuring your port. The router already has presets for well-known games like League of Legends, Starcraft, Left 4 dead, and much more. Game Radar monitors the Ping of your games servers. However, it only has a limited list of games it could monitor. This feature is particularly helpful, especially if the server you’re playing at is in a different region. The routers Wi-Fi Radar has four options — Wi-Fi Site Survey, Wireless Channel Statistics, Advanced Troubleshooting, and Settings. Wi-Fi site survey will detect all nearby wireless access points while Wireless channel statistics provides the user statistics on signal interference and information about radio channels. On the other hand, Advanced Troubleshooting provides technical information about Wi-Fi parameters and Settings will allow the user to configure the Wi-Fi radars parameters. The ROG Rapture has its own VPN feature should you need it. This particular feature of the router will present the user with visual graphs of your Wi-Fi statistics such as Period Traffic, Daily, Traffic and Percentage Use. The router also has advanced settings should you need to edit your router’s settings even further. We tested the router’s game boost feature by playing Heroes of The Storm and Paladins while other users are either streaming videos or browsing the web. Sadly, game boost provided little assistance in keeping our ping low as we experienced constant disconnections during our playtime whenever someone is excessively using the internet. We believe our internets measly maximum speed of 10Mbps is causing a bottleneck preventing us from fully utilizing the routers game boost feature. 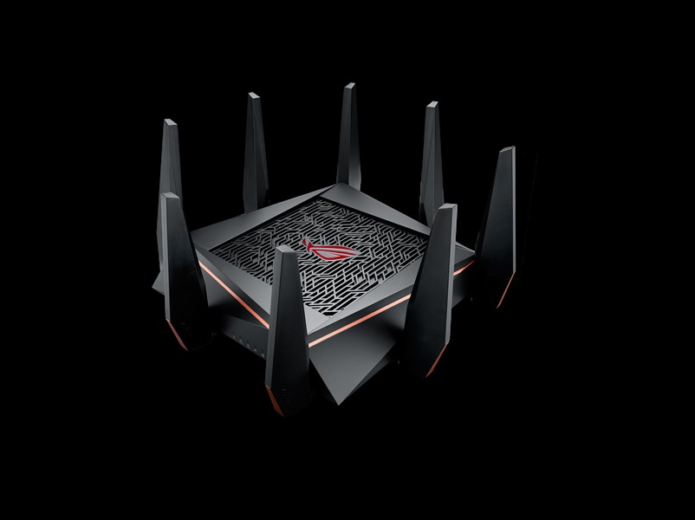 ASUS’ ROG GT-AC5300 Rapture is a router packed with features tailor fit for gamers. It’s not its only highlight though as the router also has excellent signal strength thanks to the included eight external antennas and faster than average Wi-Fi speeds due to support for 20/40/80 Mhz bandwidth. Although to be able to enjoy this router and all it’s glory users would need to have fast internet speeds to avoid a bottleneck. The appearance is a hit and miss and maybe a bit overboard to some. This is no cheap router either as it is priced at Php 23,810/$471. Whether you are a fan of ASUS or you just need a gaming router the ROG GT-AC5300 should be on your radar.